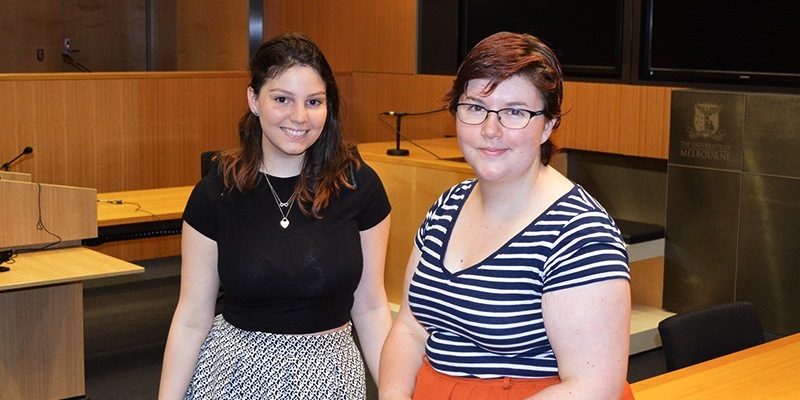 The program, Stepping Stones, paired about 40 Melbourne Law School students with teenagers from four suburban schools in a mentor and mentee relationship. At the helm of Stepping Stones this year, second-year JD students Sarah Goegan and Jacqueline Oulton say the program aims to embolden students to pursue what may have previously been seen as unattainable. "The idea is to encourage the students to pursue tertiary education, to pursue their interests in a particular area, not just law, and I feel like our students encouraged them a lot to do that," Sarah says. "Just for you to see what university is like when you are 16 or 17 - you might not necessarily have been to a university or have older siblings who have been to university so you have not seen what that's like - so I think that one on one interaction is really beneficial for them." Stepping Stones invited students from Roxburgh College, Mount Alexander College, Princes Hill Secondary College and Lyndale Secondary College to attend a number of law-focused events throughout the year. Most of the students are undertaking legal studies at school. "This year we have expanded to include more events, and some events during Law Week such as speeches and a mock trial at the Supreme Court, where they met up with their mentors afterwards to discuss what they had seen," Jacqueline says. "We also had them attend Open Day to show them around the Law School and then main campus. "Our last event was the first-year witness exam grand final, and had mentors attend with their mentees." Whilst Sarah says those students who have participated and attended events have been inspired, Stepping Stones also offers them a valuable reality check to both the opportunities and challenges of pursuing a university education. "We didn't have any qualms telling them that it is a lot of hard work going to university, but if you want it and are willing to try and work hard for it, there is no reason why you can't, and there are a lot of opportunities for you to do so," she says. The pair believes the program has been successful largely because it has benefited both the mentors and mentees. It is also not onerous on the time of law students. "The perspective is so important. It is easy for law students to get trapped in the law school bubble so breaking out of that and seeing someone who is at a very different stage in their academic journey and saying this is what I do, what are you doing, can be beneficial," Sarah says. "It is not overly demanding on students but it does make such a big difference." Stepping Stones is administered by the Melbourne University's Law Student Society in conjunction with the Street Law subject.